Homepage. This page: Britax car seatbelts available for cars built in the early 1960s. All new production cars are fitted with seatbelts as standard, but in the 1950s and 1960s this was anything but the case, and most drivers chose to do without. There were several reasons quoted for opting-out of seatbelt wearing, these included a belief that they'd trap you if you were stuck inside the car following a collision, they restricted personal movement when sat behind the wheel, or that they simply didn't work. Another quite valid reason was that there were still plenty of pre-war and early post-war cars still pottering around that didn't lend themselves to the installation of seatbelts anyway. However, as more and more new cars took over from the oldies during the 60s, the fitment of belts, and the provision of seat belt mountings in the front at least, became more and more prevalent. 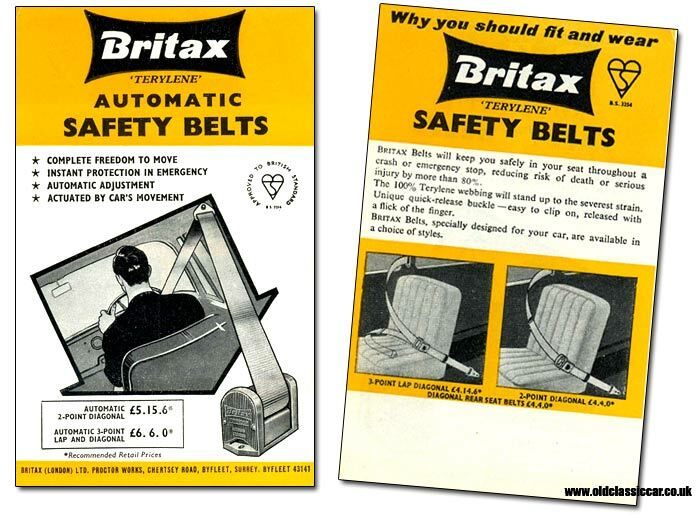 Britax were one of several companies who offered aftermarket seat belt kits to the motoring masses. This small leaflet was picked up at a Motor Show during the 1960s, and promotes their range of 3-point and 2-point diagonal safety belts, both automatic and static. The Britax 'Terylene' Automatic Safety Belts, what we now refer to as inertia-reel seatbelts, were considerably more user-friendly than the static type of belt that was common, in that they allowed you to lean forward and move around generally, without feeling like you were being strangled. Yet in the event of an emergency stop, or an impact with something solid, they'd instantly restrain you in your seat. Given that cars often didn't feature collapsible steering columns back then, any opportunity to lessen the chance of an impact against the column was probably a good idea. Prices were £5.15.6 and £6.6.0. The leaflet also has illustrations of both the 2- and 3-point static lap belts on offer. The 2-point diagonal was the cheaper of the two, retailing at £4.4.0. Better were the 3-point versions, although being static belts, they were not as convenient as the inertia-reel type. 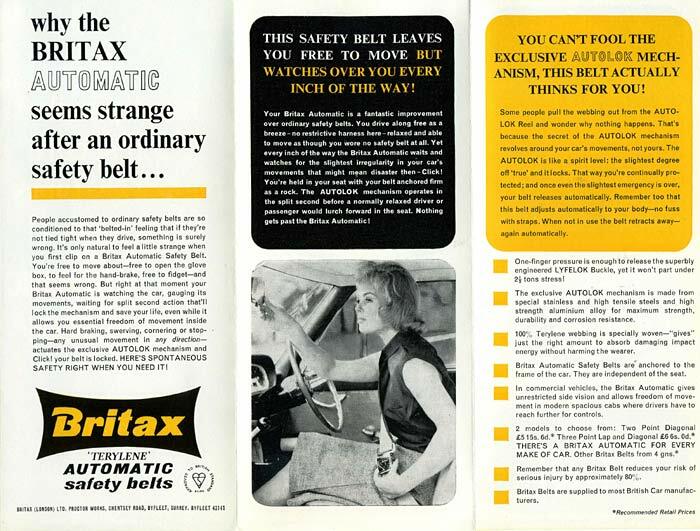 A second leaflet issued by Britax in the 1960s looks at the technology of their belts in more detail.